Friends, I have such a fun treat for you today—my first interview is finally done! My heart for doing this is that y’all would be encouraged by other women I love who love Jesus, but also struggle to get out of bed some days. I feel like when we're able to say, “Yes! Me too!” we don't feel so alone in our situation or season we're in. I know God is teaching all of us different things in different ways—so my prayer is that you'll be encouraged by something my sweet friend Jenny has to say. She and I have become good friends over the last few years and her joy, authenticity, and love for Jesus are so refreshing. I never leave a conversation with her without being blessed in some way— so I know you will too. Go-to meal to feed your crew: Spaghetti… easy, fast and everyone is happy! Favorite thing you’ve read lately: It has been a while since I have read an entire book. But the last thing I read was Simply Tuesday and it was refreshing! Although, recently I have started to re-read Redeeming Love just for fun. I loved the book years ago! Something you splurge on: We live on a super tight budget but if I allowed myself to splurge on anything it would certainly be Home Goods. I LOVE decorating spaces! Favorite Instagram follow: @therealbrookewhite. She. Is. Hysterical. Her humor is right up my alley. It’s mainly her Instagram Stories that make me laugh! In a pinch beauty tip: Mascara and then bronzer on the cheeks! Funny thing, my in a pinch beauty tip is my normal routine. hah! Guilty pleasure: Hmmm.. Grey’s Anatomy...I am still a faithful watcher and I LOVE it. Worship album you're loving right now? Anything Patrick Mayberry :).... I do love him and his music but for real, because my days can feel so loud with four children at home— I really enjoy listening to instrumental albums. I love worship albums with words, but sometimes the words just add to the chaos. Some of my favorites are Bethel’s Without Words and United Pursuit’s Sacred Mountain. Fun fact about you: I always wanted to have an even number of kids so that everyone would have a partner on a roller coaster. 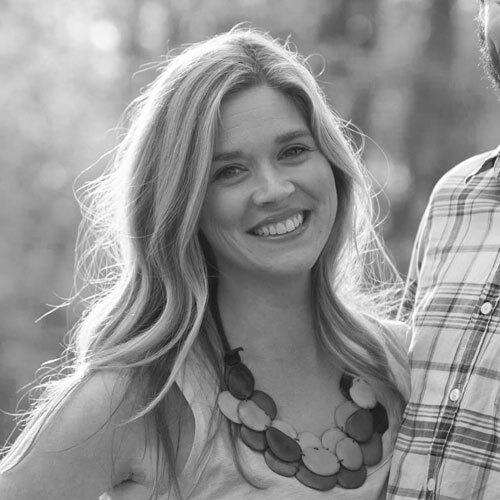 I feel like you're killing it with 4 kids ;) Any tips for moms with a lot of little ones? Ha! I doubt myself daily if I am really honest, but as soon as those doubts creep in I remind myself that this is the family God gave me. For His glory, I have four children and he trusted me with them, so I breath a little and ask the Lord to help me a lot. Also, I try as much as I can to let things go and choose my battles. I want to parent out of love not out of fear. I know you’ve loved living in Chicago, but I also know that being away from your family and your hometown has been hard. What's your encouragement for someone struggling with a similar situation: Yes! It has been amazing and hard and fun and stretching and sad and so good. I mean you name an emotion about being here and I have felt it. Good and bad. Chicago specifically is a special place and God has used this season in our life to teach Patrick and me a lot about the way He wired us. I can sing our church’s praises all day for the way they foster self growth and transformation. We didn’t know it, but the choice to play it safe here is not an option. The people we have surrounded ourselves with are pretty incredible and make me a better me—that’s the good part. The hard part is I grew up with extended family around all the time, and my kids don’t have that at all here. It makes me sad a lot, but that’s where God comes in and reminds me that He hasn’t forgotten my kiddos and that He actually loves them more than I do. So, what would I tell someone walking in a similar season? I would say find your people, be honest with them and yourself. Ask the Holy Spirit to speak clearly and give you chances to “practice” listening to Him. Find people who can help you call out lies when you start to believe them and people who point you to Jesus. What does it look like to spend time with the Lord when when you're running on little sleep and you're rarely have a second to yourself: I have an ongoing conversation with God in my head most of the time. I just invite the Lord into that and I claim that He is in my thoughts. After I had children, carving time out in the morning for my “quiet time” became more difficult for me. But what’s awesome is that my relationship with Jesus has grown leaps and bounds because I am not dependent on that morning time to give my relationship with Jesus depth, make sense? Should I be pausing to be still with the Father? YES... absolutely, but I have found such a beauty in being with Him constantly. 1 Thessalonians 5:16-18 says, Be joyful always, pray continually, give thanks in all circumstances for this is God’s will for you in Christ Jesus. I have always loved this verse and desired to live my life by it. After changing up my routine with the Lord and talking to Him throughout the day I finally feel like I understand the “pray continually” part. I just talk and listen continually and it’s not always sweet and peaceful and pretty. Sometimes it’s angry and confused and frustrated. But I know that’s okay too because that is prayer as well. Your husband is a worship pastor of a church, so I know your Sundays are crazy. Do you have any tips for other mamas for those hard Sundays? Whatever it takes, just give yourself grace. Sundays are not always my favorites. I have tried to change my mindset many times and maybe one day I will, but for now I miss my husband on those days and I long to just go to church with him. And also, you have to give yourself permission to…. Also, have a safe person who you can vent to and celebrate with...someone that can listen if you need space to not love Sundays for awhile! What lie do you have to refute often, and what truth do you hold onto in those moments? Pretty much everyday I have to refute that lie that I am messing up my children. I feel so often that I am doing it wrong. I lose my temper, find myself staring at my phone and missing moments, checking out and wanting to nap. What I have realized is that I could spend all morning making pancakes, reading to them, braiding hair, painting with edible paint, all while folding laundry and doing dishes and with just ONE slip up, and I think I'm a bad mom. So I have to combat that lie with prayer. When the thought slips into my head, I call it out. I ask Jesus, “Is there some way I could do better here? Is this feeling I have guilt or shame driven?” and then I listen and move forward. I think the Lord allows us to experience guilt to push us to be more like Him, but I believe shame says I'm unworthy—which is straight from the enemy. So if it’s shame, I have to call it out as just that. Mistakes don’t make me a bad mom, they make me human. So true! In your day to day, what does it look like to receive grace. From yourself, and the Lord? It’s pretty much a constant conversation with the Lord in my head. I check with Him and when I am doing that well, I hear his grace whispered to me in the moments I need it. Also, I receive His grace through my friendships. I have people in my life who I talk to on a daily basis (thank you Jesus for Voxer) that call me up and point me to Jesus. They are grace-filled for me and push me to lean into the grace of God. In a world that tells us that perfectionism will make us "happy" and fix all our problems, how do you push back against that, and walk in freedom from "perfect"? I had a visceral reaction to just reading that question. First, I have to remember perfectionism takes me to the total opposite end of the spectrum from freedom. I am one of those people who likes to bow out gracefully before I lose—and perfectionism is a battle I will NEVER win, so I just bow out on this one. I believe that when I strive for perfection, I'm really trying to control things. So how do I push back against that and walk in freedom from "perfect"? I have to daily remember to walk in the Spirit of God. Don’t get me wrong, things pop up daily where I am pushing for perfection and thankfully I have dear friends who call me up by saying “Snap out of it, Jenny” and when my ear is tuned into the Holy Spirit, He reminds me of this scripture. Any encouragement for cultivating authentic friendships in your stage of life? Another tip, once you find your people, go deep quick. Ask each other tough questions and listen well. Friendship is something that is cultivated and grown. Find a small group and go all in. Be honest, be you, you are enough and you are a good friend! People, at their core, want connection so I would say look for that with other believers! Some ideas: book clubs, Bible Study Fellowship, Community Bible Study, small groups at your church, Thrive Moms, MOPS, or get on the internet and look up ways to connect in your area. Who knows, maybe you’ll have luck with that first group! Just don’t give up, if the first few times are awkward, push through and keep trying. Having “your people” is sooo worth the awkward starts. You have an adorable side business, @Oh My Letters! 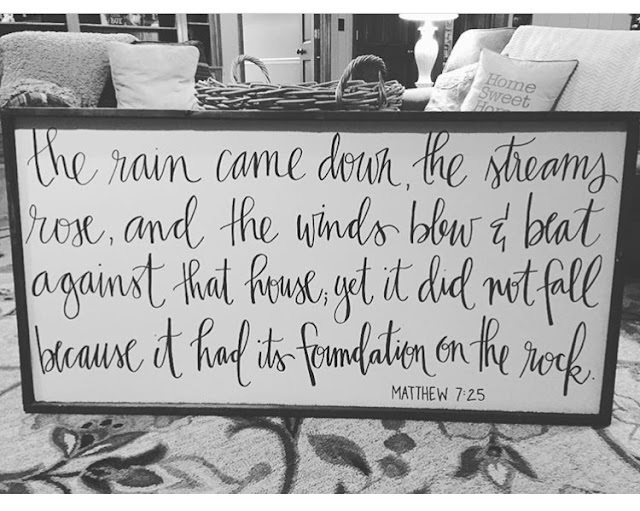 Tell us a little bit about it and how you balance it with family: I have a lettering business on the side where I make custom pieces with scripture, song lyrics, or other quotes. I need Truth in my face, so I have always loved having scripture on my walls of my home—so I thought this would be a fun way to do this for others too! For me and Patrick, communication and planning are key for making this work. We must plan ahead and follow a schedule, which we are not the best at. Patrick takes the kids out for a few hours while the babies are napping and I can work on my projects, and I take the keep the kids out of the way when he builds the signs. It takes team work! What advice would you give the Jenny from 10 years ago? Oh man! This is a great question and honestly one I have never thought of before. Ten years ago I was 22, not married and had just graduated college. I would tell myself to stop and soak in every single second. I would tell myself to listen to the Holy Spirit nudging me and to stop comparing myself to everyone else. I would tell myself to read a Brene Brown book and start telling a safe someone all the thoughts I had in my head (comparison was crippling to me then). I would tell myself to sit in as much Scripture as I could handle, and to laugh more. What would be your perfect Saturday: Below is a perfectly realistic Saturday. Ha! Perfectly unrealistic would be on the beach somewhere. Sleeping in and waking up to a family breakfast already made! OR going out to eat breakfast at Buzz Cafe with our crew. Then something outside...anything really, park, farmers market, zoo, etc. Heading home for naps (perfect Saturday, all children would nap) and I would sit in my backyard on a quilt with a cup of ice! Then everyone would wake up happy and we would grill out for dinner and eat as a family on our back patio. Maybe a bonfire with s’mores! Bedtime would go smoothly and then Patrick and I would cuddle up and watch a good movie. Any tips on keeping the spark alive in your marriage while raising lots of kids? Date your spouse, even if it means in-home-date-nights (we do these). When it comes to your mind, ask Jesus to breath life into your marriage. I told Patrick that I wanted to start kissing him everyday (is that terrible that we weren’t doing that already?!?!?) just to make it a habit. This is advice we want to take more often because we have only done this a handful of times, but plan time to get away together, even if it is just for 24 hours. Wise couples have told us they do this four times a year and it is so good for their marriages. Y'all! So good, right?! Thank you Jenny, for being so honest and sharing your heart. I love hearing what God is teaching other women and gleaning up some truth + wisdom! Again, you should go ahead and follow her on Instagram—it will make you smile, I promise. Yes I totally agree!! She did such a great job! Love it Jenny!!! I totally relate to so much! This was wonderful! And I totally get the Sunday blues.. husband serves in ministry as well. Thanks for reminding me to give myself grace on this particular day.